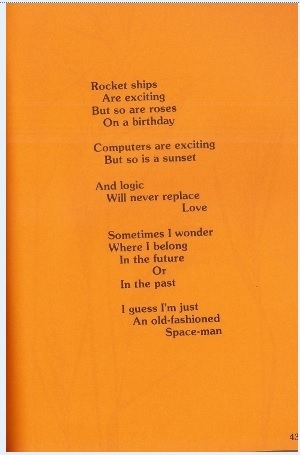 Holly passed on this submission and with rolled eyes said…”oh this one is for you!” I know virtually nothing about poetry other than nothing really rhymes with orange. I have no idea if this is “good” poetry. I am thinking it isn’t. I am Trek fan from WAY back and love everything from the original series to the latest movie. Mr. Spock has always been a dreamboat in my book. I hope this was simply an experiment. You should eBay that and donate the funds to the library. There are devoted Trekkies/Trekkers who would love to have it. Well, at least it’s better than Rod McKuen! Okay, okay, actors could have a literary side. I thoroughly enjoyed “I Am Not A Cop” by Richard Belzer. Are these in free verse–or Binary? You’ve got to get “I Am Not A Psychic” next. Put up more of these poems. I have a bile fascination with this. That’s the only thing I’ve heard that even comes close! Thanks. Any poetry books (always from the 60’s and 7o’s) that have black and white photos or little illustrations accompanying the poems should always be weeded. These are never the books of good writers, or any who might be included in the contemporary literary canon. Never. It was a marketing gimmick to sell books that resembled “Jonathan Livingston Seagull.” That said, I think rpgadvocate has an excellent idea of auctioning this to an interested fan. ah, but they are so, SO bad…they’re wonderful. i instantly snap up any hippy-dippy book full of poems, rants and those contrasty, stark, ultra-saturated, ultra-arty, b and w pics. anything like that from ’66 to ’76, esp from CA is CHOIC E.
Yep. You know yours stuff! Oh man, I was just going to say I thought he had Vulcan confused with Vogon! Definitely not logical. But fascinating. Certainly raised my eyebrow. I was hoping for some pics, a la Burt Reynolds! Most the time he just promotes his store Secret Selves, but occasionally he gets into Tweet-spats with Shatner. I got them going a few weeks ago by reminding Nimoy that Shatner stole his bike. That all being said, I wonder if I could get him to Tweet about this book of poems…. That “Secret Selves” store is a small operation selling through Etsy, which is a retail front for lots of artisans and so on. My 16-year-old daughter sells hemp wristbands on Etsy, too. I know, but that’s what Nimoy tweets about the most. That and Twitter-battles with William Shatner. Whereas LeVar Burton tweets a lot about bars and retweets the Dali Lama a lot. I really do think you should ebay the books you’re weeding. Library would love you for it potentially, and your fans would find it awesome. But his records are wonderful.Anyone hear The Ballad of Bilbo Baggins? It’s funny! Totally tongue in cheek stuff! 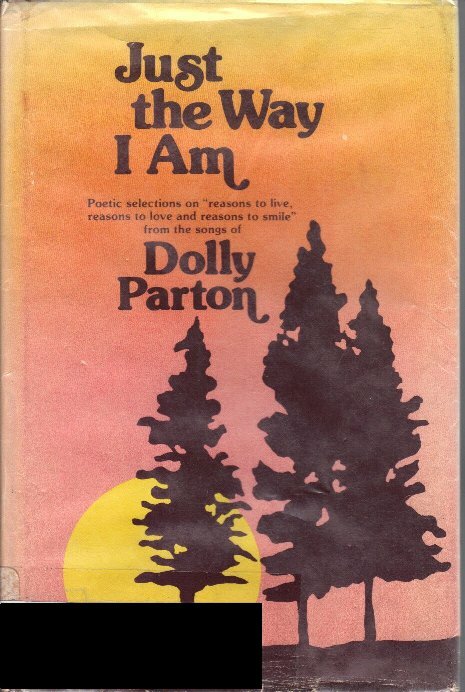 The 70’s are full of bad things,polyester,disco,and plenty of bad poetry. Nimoy has had published a half-dozen of such poetry books of various degrees of awfulness. His photography is better than his poetry, however (and I’m not being sarcastic). Give me Has Been any day. 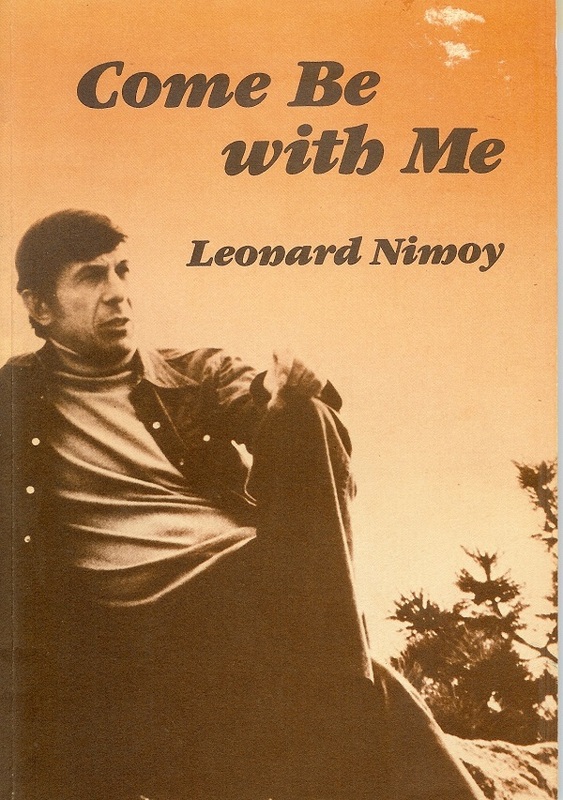 Haha, oh, awesome, I OWN this book 🙂 A friend got it for me for Christmas, and got some other friends in our circle other editions of Nimoy’s poetry. It’s so awful that it’s wonderful. My best friend gave this to a woman on their first date. It worked magnificently – they’re still together, many years later. I was quite jealous: I wanted it. It’s a perfect example of its time: vague haiku expressing a vague wish that we could all get along, by someone famous not for poetry, but for acting. The start of the idea that ‘celebrities’ were automatically competent at absolutely everything? If you like Nimoy’s “poetry,” you will love his “singing”! Here (with a literary theme) is The Ballad of Bilbo Baggins for your… enjoyment. OMG! This is the first book you’ve had on here that I actually own! The Blue Mountain Press poetry books were pretty popular in the late 1970s and early 1980s. I actually have 4 of them, although now that I think about it, I’m not really sure why I’ve kept them all these years! I thought it was kind of cute. Who knew Nimoy wrote poetry?! Great orange pages, too. You haven’t lived until you’ve heard “Lucy in the Sky with Diamonds” performed as a spoken word piece by Captain Kirk. Bitter dregs, indeed! Oh… oh no, my mom has this book, and a couple more by him. There are five total, all published by Blue Mountain Press/Blue Mountain Arts. Thank you Eric, Bilbo Baggins is cool! He put that record out while doing Star Trek,he’s got a great sense of humor. I don’t know why you’re all so down on disco. Donna Summer’s MacArthur Park beats Lady Gaga’s Paparazzi any day of the week. And The Bee Gees have more talent in on hair on their head then Justin Timerlake has in his entire body. Again the 70s was the last good decade for music. Ever since music has just sucked. So quit ragging on the excellent disco. I just got this one through ILL, and it is gloriously awful. My fiance and I may try to incorporate some of the “best” poems into our wedding. Syringe and lozenge are close, too. I own this book. The poetry is bad, but I’m thinking Leonard Nimoy could sneeze into a Kleenex and huge amounts of Trekkies would want to buy it. @Jamisings: The ’70s were the last decade of good music *in your opinion*. I respectfully disagree.